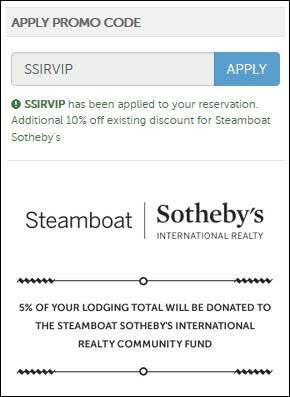 The Resort Group has created a VIP Lodging Discount for clients and friends of Steamboat Sotheby's International Realty. So as you're planning your next visit to Steamboat, here's a way to save some money on your stay. Best of all, 5% of your lodging fee will be contributed back to the SSIR Community Fund for all bookings using the SSIRVIP discount code. Look for the promo code field when booking your next stay and be sure to use SSIRVIP. Please enjoy the savings while supporting Steamboat Springs local non-profits. And let me be the first to welcome you to Steamboat and our wonderful community.